Very rarely do two chapters of my life confront one another directly. Most of the time I pass my days evolving, hoping that things I have done in the past that became pieces of me will just fade into memory and not have to be repeated. But two of the great things about Charlotte is that she makes me want to open that wunderkammer of my past AND analyze it in the fresh light of my present self. And so it happened that one evening after coming out of the Cinemex on Avenida Reforma in Mexico City. We had just seen Wonder Woman, about which there was much fanfare, specifically the debate about whether or not it was feminist. Our analysis of it boiled down to: the first half does indeed touch on numerous good topics for feminism, but the second half leaves them all undeveloped for the sake of tired superhero-movie cliches. Referring to the CGI’d and over-the-top final battle scene, Charlotte wondered aloud if it had jumped the shark. “Jumping the shark” is one of many phrases of American English I learned from her since we started dating almost ten years ago. Every couple of months or so she will say something like “bull in a China shop” or “as the crow flies,” and I will have to ask her to explain. In this manner I learned what “jumping the shark” means, that it originated with the show Happy Days, where, in the fifth season, The Fonz (a character close to my heart for coincidental reasons) literally jumps over a shark on a pair of water skis– a scene which signaled that the show had exhausted all possibility of development and therefore had no other recourse but to do something truly over-the-top to maintain viewership. I understood what Charlotte meant: like many superhero movies (both from DC and Marvel), Wonder Woman suffered from trying to cram too much plot into one feature. Attempting to fit an origin story, a love story, and three villains into 140 minutes, they dug themselves into a hole by the end, leaving no cinematic way out for Wonder Woman to defeat the bad guy other than with a kind of cataclysmic explosion. Using her mysterious powers (which we only hear a cursory explanation of) combined with the power of love (for a character which she had only known for a week), she absorbs the lighting-like energy from Ares into her wristbands, stores it, jumps (or flies) high into the air, then releases it back at him, causing a huge explosion. All that is left when the dust settles is a crater. The movie ends. Wonder Woman absorbs Ares’ lightning bolt. Image still from FilmicBox’s YouTube video. Seeing that scene, in conjunction with the phrase “jumping the shark” which was fresh in my mind, suddenly set off a whole train of thought which is the subject of this post. As a teenager I was an enormous fan of the Akira Toriyama-created Japanese manga-turned-anime series Dragon Ball Z. This is the first time I am even publicly announcing this. Why it has never surfaced up to this point is most likely because of embarrassment in retrospect, since it is widely accepted that Western consumers of manga and anime are dorks to the maximum degree. Between about the ages of 12 and 17 it occupied much of my life, including that of my parents whom I regularly asked to leave work and come home to record new episodes on VHS while I was at music school. And like riding a bicycle, certain parts of the show have simply lodged themselves inside me, pegged to the pinboard of my brain like old postcards. Thus the story’s plot crossed my mind as I thought of Wonder Woman. In short, Dragon Ball Z is about a Superman-type alien protagonist with superhuman powers who lands on Earth as a child and spends his entire life defending the planet from various enemies. The whole series sees no less than twenty main villains, and totals 291 episodes across 7 sagas. Think about that for a moment. For perspective, Lost, the ABC TV show which everyone agrees went on for too long and got too complicated, had only 121 episodes in total, less than HALF of DBZ. Eventually, a television show with such an ambitious scope has to run into serious narrative challenges developing the characters, making them stronger, making the stakes higher, etc. At what point does a show like DBZ jump the shark? Episode 5, in which Piccolo kills both Raditz and Goku. DBZ begins with the arrival on Earth of the protagonist Son Goku’s malicious older brother Raditz, who has come to kill the former. After 4 episodes, Son Goku sacrifices himself to defeat Raditz. That’s right: in episode 5 of 291, the protagonist dies. What’s next after death? Akira Toriyama employs a storytelling method like many stories before and since. He suddenly zooms out of the story’s time and setting, introducing higher and higher dimensions in an expansive multiverse of which Earth exists on only the lowest rung. Once those higher dimensions and larger narrative frames are introduced, you can throw the old rules out the window and explain yourself out of trouble with brand new rules. To me, these dimensions have always been a cop-out, since the moment you learn that a hero goes to an afterlife and can be resurrected, the significance of fighting and dying in the Earth realm is irreversibly diminished. But in most of the early stages of the story, we only know of one rung above the Earth realm, and that a person can only die and be brought back to life once. In other words, the story still imposes limitations on itself, and these limitations make the battles more exciting. Being impaled through the torso by an energy beam (in Raditz’s and Goku’s case, above) or being fatally dismembered by a sword (in Vegeta’s first case, below) are real, violent acts with real consequences. Episode 35, Krillin threatens Vegeta with a sword. The characters acknowledge and resolve this moment in real-life terms that we the viewers can grasp. However, as the story expands, the characters get stronger and stronger and quickly we lose our sense of reality. By episode 78 we have our first fighting power level (the universal measure of a character’s strength) of 1,000,000, a number which I think more than anything is usually employed to signal an amount beyond human understanding. 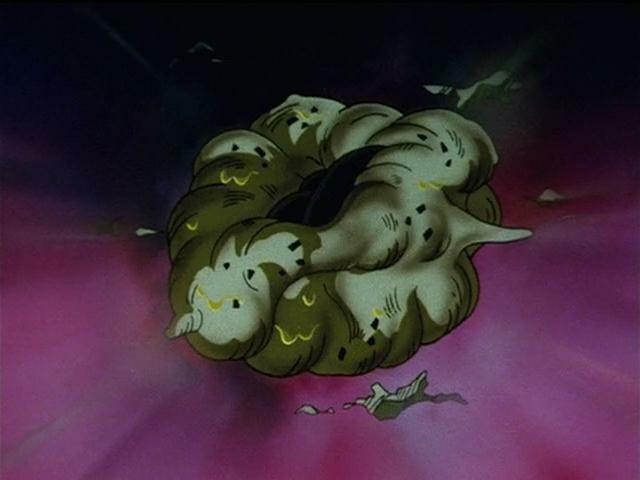 This power level is reached by Freezer, one of the show’s most iconic arch-villains, who happens to be an alien who can not only destroy entire planets with a single attack, breathe in the vacuum of space, but also survive being dismembered by an energy disc in episode 104 (remember that in episode 35 Vegeta was about to be dismembered and killed by a regular metal sword, but was spared). …but does not die. This moment is outside of the realm of human experience. Before Freezer, we had villains like Vegeta, who, though powerful, also had weaknesses and were characters with depth. With Freezer, the precedent was set for villains who had no depth, who all fit the “Evil Chaotic” mold in the Dungeons & Dragons Alignment Chart. The Joker in the world of Batman fits this mold as well: a villain with vague origins and motives, who simply IS evil beyond any analysis, and exists only to destroy life. Where to go from there? Sharky waters loom. The Android and Cell Sagas that followed took the same mold of Chaotic Evil villain and erased any possible remaining weaknesses. The Androids had unlimited energy (they could shoot energy beams all day long), and most notably, Cell possessed all of the heroes’ moves, including the ability to regenerate entire portions of his body. So much for dismemberment. Now, the only way to destroy Cell was to completely vaporize him with an energy wave (this was never explicitly stated, but everyone simply understood it). That, to me, is the ki equivalent of proclaiming a power level of one million: it signals that we are beyond the scale of human understanding. A single cell survives Cell’s self-destruction, and undergoes mitosis to restore his body. In episode 189, even after self-destructing (! ), one of Cell’s cells survives and mitotically restores him to his fighting form. He returns to the battlefield and charges up one last energy wave to destroy Earth as we know it, but is miraculously defeated (for real this time) by Goku’s son Gohan, with an almost identical energy wave. Cell is completely vaporized by an energy wave, and destroyed for good. But there remained something deeply unsatisfying in that vaporization of Cell. It felt like DBZ had painted itself into a corner. By creating an all-powerful, multidimensional, self-regenerating, alien-android hybrid supervillain, the show had to resort to nothing short of a cataclysm to make the good guys win. It was dealing in things beyond real human experience. It had jumped the shark. For the remainder of the show, the villains repeated this basic mold, the battles became drawn out and famously cut+paste, the story had to introduce multiple dimensions to justify complex plot lines… the series generally plateaued. 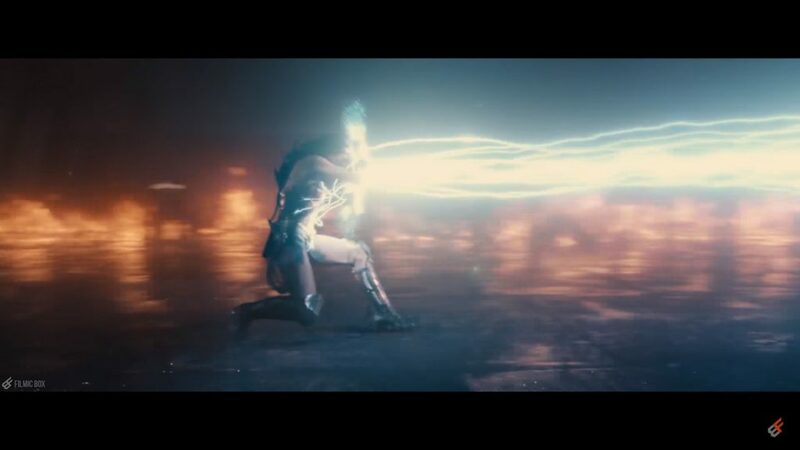 The energy waves in DBZ even resemble the beam that Wonder Woman absorbs and fires back at Ares: a linear, bright blue, plasma-like beam which, presumably like gamma radiation, simply vaporizes whatever it passes through. Was it even necessary for Wonder Woman to have this epic CGI battle with Ares? How do you follow that up? Will Wonder Woman’s enemy in the next movie be just a glowing cloud or omniscient God which so many Marvel villains seem to take the form of (see: Ego in Guardians of the Galaxy Vol. 2; X:Men Apocalypse; Dormammu in Dr. Strange)? Wasn’t it exciting enough when she ran out into no man’s land and headlong into machine gun fire? Couldn’t the movie have made that the only battle scene? There felt to be more at stake in that first battle scene, precisely because the consequences were still within the realm of real human history and experience. Introduce CGI villains with no apparent weaknesses at your own risk, because then you leave yourself no choice but to jump the shark, and splash right into the tepid pool of chlorinated water you yourself have filled.